With spring here, the roads should finally be snow-free soon — just in time to enjoy driving a brand new 2019 Mazda! The changes made to your favourite cars are sure to please. Your local dealership has a huge selection of Mazdas in every model, especially Mazda’s most popular models — the Mazda3 and the CX-5 crossover SUV. If you already know what you’re looking for, then reach out today and come to Yorkdale Dufferin Mazda for a test drive! But read on if you’d like to learn more about what’s new with Mazda for 2019. Mazda’s most popular car has received an upgrade that fans of the old models are sure to go crazy for: the Mazda3 is now available with Mazda’s famous SKYACTIV Technology! SKYACTIV is Mazda’s patented driving system, which gives each car a functional set of advanced instincts and the ability to communicate to the car the safest way to drive. Twenty-seven sensors scan the road constantly 200 times per second to ascertain what the road conditions are like so that the car can make adjustments accordingly. For example, if the car senses that the road is wet or icy, then more torque is automatically supplied to the back wheel as needed. Not only that, the evolved SKYACTIV AWD in the 2019 Mazda3 is especially fuel efficient, and will only give the car this boost just when it’s necessary. You need to drive it to believe it, so come check out our showroom and book your test drive today. The Mazda3’s redesigned cabin is now the quietest one we have ever offered, and unnecessary vibrations have been muted. This makes for a pleasant, even tranquil driving experience. This relative silence is perfect for appreciating the Bose sound system custom made for the Mazda3. No less than eight speakers were arranged to create a concert hall effect you’re going to love at any volume. Upgrades were also made to the Mazda Connect infotainment system, so interacting with your technology is simple and intuitive. Inside and out, you’ll go crazy for the new Mazda3. 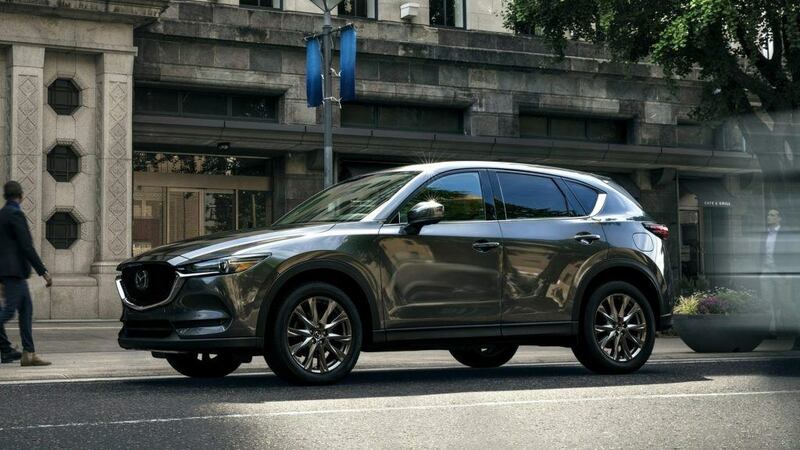 One of the most popular vehicles in the Mazda fleet, diehard fans of older models are sure to love the changes in the new 2019 CX-5 Crossover SUV. No transformation was necessary — for one thing, the CX-5 already had the SKYACTIV technology new to the 2019 Mazda3. But the upgrades are considerable. New for the 2019 CX-5 is a Skyactiv-G 2.5 Dynamic Pressure Turbo engine. Turbocharged engines are often known for lag, but this new engine gives more power at lower levels of RPM without any lag and the difference behind the wheel is palpable. On top of this, Exhaust Gas Circulation technology makes the engine considerably more fuel efficient, while also supplying best-in-class torque. You won’t believe a vehicle this large can move with such pep! The infotainment centre has been seriously upgraded, too. It’s easy to integrate your Android or Apple phone with the system, so you can stay connected with your music, messages, emails and phone calls. There’s also a custom-made Bose sound system with 10 speakers, which was designed taking into account things like the way materials in the car affect sound quality and variance in digital music. Cosmetically, the Signature model comes with Nappa leather and Abachi wood trim. These are the final touches on a Crossover SUV that truly has it all: compactness, power, ruggedness, and grace. People around the world loved the 2018 version of these classic Mazda vehicles. With all the changes made, the new 2019 models are sure to be loved even more. Visit Yorkdale Dufferin Mazda, and get behind the wheel for a test drive!